From the usual streetfights to award-ready comedy bits: this year's major football event has seen the full scope in fan behaviour. One key component to any championship are the ones who aren’t even allowed to touch the green grass. They are the ones who make it all worthwhile, the ones that make it all work, because at the end of the day this should all be about and for them. They are the fans. There are a variety of reasons why it actually was a great idea to expand the number of contending teams to 24. Letting 24 nations compete for the title gave the opportunity to present themselves on the big stage to some nations who previously never had that chance. The likes of Iceland, Hungary, Albania and Wales have shown the true nature of celebration. And as being a life-long football fan is not about talking the talk, here are just some of the best clips and pictures. They’re worth more than a thousand words anyway. This year’s event at certai times has been some kind of a Hooligan’s Paradise. Even two days before it oficially started, fights broke out in Marseille as England’s and Russia’s top boys kicked off against each other – with the local yobs and hooligans of Olympique Marseille occasionally guest starring. The battle lasted for several days and rearranged the shape of the city’s old-town area completely. Poor locals had to make sure they don’t get caught up in 2016’s inaugural Chair Throwing Championship. French and Russian fans / hooligans battling it out in Marseille, semi-wrecking the whole downtown area. And just to prove it’s not just England to cause trouble all the time, the good people of Poland, Northern Ireland, Germany and Ukraine also joined in to the fun from time to time, making the group stages exciting on all grounds. The Irish fans absolutely belong to the group of ’The Good’. 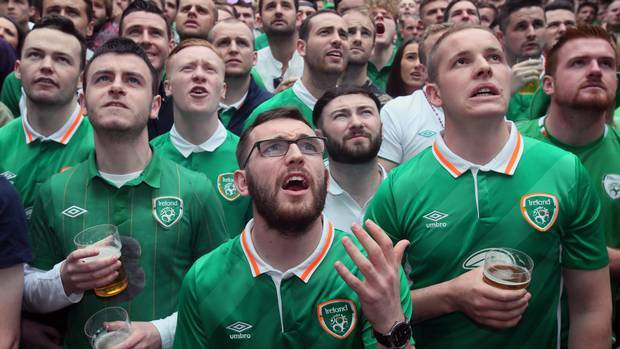 But to be honest, since Irish fans are pretty much all of the time winning prizes for being the best collection of supporters, they very well deserve their own category. No violence induced by them at all, just celebration, overflowing alcohol and friendliness, all accompanied by witty songs and hilarious shenanigans. Because of this alone, we always all hope they make it as far as possible just so we can laugh our asses off at football’s number 1 comedians. We are closing with some of their very best.